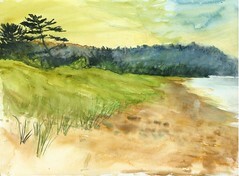 Shoreline at Harvey: Lake Superior — the colors were so vivid when I made this sketch — was it just a month ago? Labor Day, I guess. But overnight, the scene has switched to grayscale mode. Shoreline at Harvey: Lake Superior, originally uploaded by miss_distance. The lake is roaring “Happy Thanksgiving” this morning! Snow and sleet fell while we were sharing a feast with friends last night — now everything is white, and the marram grasses are glazed with ice. 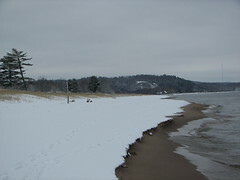 This photo shows the same shoreline (Christmas’06) – minus a pine that blew down last winter.